The signs of an on-the-horizon upswing were all present when the St. Helens baseball took on Wilsonville in its series opener on April 9. Senior starter pitcher Jacob Klein put on his best showing of the season on the mound. 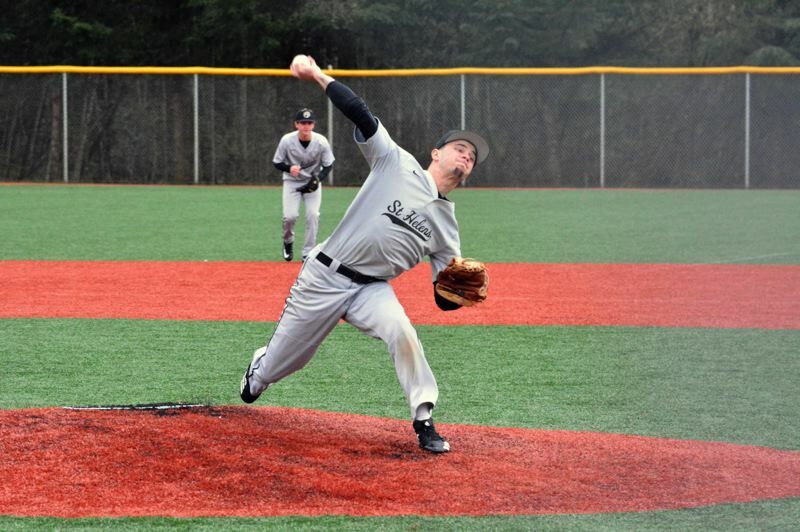 Underclassmen such as Jackson Hald and Jacobi Allen hammered the baseball against arguably the best pitcher in the Northwest Oregon Conference in Wildcat senior Nolan Thebiay. Senior Chris Beatty smashed a single back up the box. First baseman Justin Olson fielded his position superbly, stretching out and scooping up grounders off the gruff Wilsonville field turf. Wilsonville won 6-0 despite tallying fewer hits as the Wildcats scored three runs in the sixth to fully pull away. Still, St. Helens didn't play like a team that was 1-10 going into its away game with the Wildcats. The Lions' early season mark, skewed by playing some of the best teams in 5A and a handful of bigger 6A schools, doesn't do St. Helens justice. The young club is improving and progressing in the right direction. "We did everything we needed to win today except put runs across the board," St. Helens head coach Jeff Timmons said. "We played defense and pitched well enough to win. We just didn't score any runs. We're coming along, hitting the ball a little bit better, putting it in play, making guys work. We're still young and trying to feel our way out. But I was proud of the way they played today." Wilsonville's homefield advantage was on full display early as the Wildcats legged out two infield hits, using the chalky old school turf to its benefit. With St. Helens' infielders expecting a faster surface, the Lions stayed back on both grounders, only to be bamboozled by the slower terrain. Further, with so much extra room to roam behind first base, Wilsonville exploited a couple of errant pickoff attempts to first, which sent St. Helens scrambling around the lot and allowed the Wildcats to get out to a 2-0 lead in the bottom of the first. The Wildcats scored three of their runs off wild pitches or pick off plays. Klein was pegged as the Lions' ace coming into the season and the senior surely looked the part against a solid Wilsonville squad. The righty worked out of bases loaded, nobody out jam in the first and escaped the frame allowing just two runs. Klein retired seven straight at one point, unleashing a curveball that was on point and ended up working five and third innings. "When he's dropping that curveball for a strike and has confidence that he can throw that at any time, all of a sudden his fastball becomes three more times more effective," Timmons said. "He really mixed (his pitches) well. That's the kind of outing we've been looking for out of him all year. We just have to help him out a little bit better." Sophomore Kaleb Edwards has emerged as a promising starting pitcher alongside Klein, Allen and Drew Sullivan in the rotation. And freshman righty Trevor Fitzgerald came on in relief of Klein and retired two hitters in the bottom of the sixth against Wilsonville. Timmons said Fitzgerald has continued to impress whenever called upon. Edwards and Hald both worked Thebiay into full counts that ultimately turned into walks in the first inning. Junior third baseman Garrett Harris had a hit off Thebiay in the fourth. Allen destroyed a fastball off the glove of Wilsonville shortstop Trevor Antonson, nearly knocking the mitt completely off his left hand. Hald's single to right in the sixth was a pulled missile that cleared the Wilsonville second baseman with ease. St. Helens' five hits were a good sign going into the final two games of the Wildcat series, both of which will most likely be played at Wilsonville High due to the rainy weather. "Our freshmen and sophomores are putting the ball in play off a guy like (Thebiay) and they're only going to get more confident," Timmons said. "Next year they'll say 'This is old hat, we're expecting to see guys throw this hard'. Those guys squared (Theibay's pitches) up once they figured it out. Going forward I think we have a shot in the next couple of days."